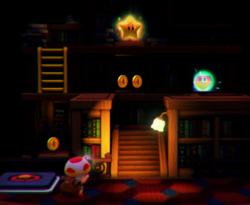 Spinwheel Library is the 7th course of Episode 1 in Captain Toad: Treasure Tracker. This level takes place in a Ghost House. The player starts next to a Spinwheel, which is used to rotate the center part of the course. The player simply needs to rotate the Spinwheel twice (180 degrees) to reach the course's Power Star. Super Gem 1: In an alcove that can only be accessed by rotating the Spinwheel 90 degrees to the right (from its starting position). Super Gem 2: Accessed via a staircase that appears by rotating the Spinwheel 90 degrees to the left (from its starting position). Super Gem 3: From the Spinwheel's default position, the player can access a purple Warp Pipe that goes to the underside of the course. Here, the player can find Blue Toad, who gives the player the Super Gem. A hidden 8-bit Rosalina image can be found on one of the books near the purple Warp Pipe. This was removed in the Nintendo 3DS / Nintendo Switch version of the game. Spanish (NOA) ¡Rotaexplora la biblioteca! Explore the rotating library!